After the floods in 2007 in Sheffield the Environment Agency undertook a comprehensive programme of works to clear the River Don of tree growth, vegetation and debris. Both eyewitness accounts and subsequent modelling demonstrated the capacity of the channel was significantly compromised by years of under managed tree growth and invasive species growth during the summer months. 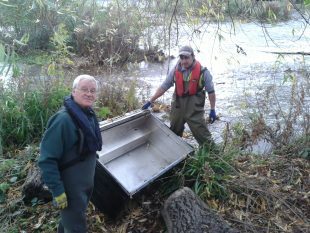 Part of the debris cleared from the river, here is an old fridge. Work started with significant tree clearance and shoal removal at a site upstream of the city centre. The scale of the work caused concern amongst local partners and the Agency paused the work and convened a workshop with partners to consider the remainder of the programme and opportunities to improve not only the current programme of works, but also to look at how the improvements to the channel could be sustained. There was an existing partnership, Sheffield Waterways Strategy Group, which had been set up by Sheffield City Council in 2004 and supported by the Environment Agency. One of the aims of the group had been to develop a mechanism for ‘river stewardship’ – financially sustainable river maintenance. The fledgling River Stewardship Company had been set up by many of the partners involved in the group in 2006 with the aim of persuading riparian landowners in Sheffield to pay the Company to deliver a river maintenance service, as well as generating social benefits for local volunteers and apprentices. Both the Environment Agency and the River Stewardship Company (RSC) could see that there was an opportunity to not only deliver the channel improvement works but also engage local riparian landowners in a sustainable solution to deliver the long term maintenance the river so badly needed. The Environment Agency funded a three year pilot-project. The RSC delivered a progamme of mitigation work to support the tree clearance undertaken by the landscape contractors on a nine-mile stretch of the River Don, running through the centre of Sheffield and the industrial Lower Don Valley. As part of this pilot the RSC started to undertake ‘little and often’ maintenance of the river, including minor tree works and invasive species management, and used this work as an opportunity to build relationships with the local businesses who were primarily the riparian landowners. The opportunity to contact them through this work, and the strategic backing/partnership approach of the Environment Agency, supported the RSC to build a convincing case for why it was worth the businesses continuing to invest in ‘little and often’ vegetation maintenance of their river bank once the main works were complete. Some of the team out and about on location. A number of businesses signed up for three year agreements, with the most significant being Sheffield Forgemasters – a major international business in the Lower Don Valley, which took the lead to champion the Lower Don Valley Business Improvement District (BID) when this emerged in 2013. This work was a key factor in the success of the subsequent BID to help fund not only a contribution to the first phase of Sheffield’s Lower Don Valley Flood Alleviation Scheme (due to be completed later this year), but also a programme of regular channel maintenance along the Don through Sheffield. The businesses already appreciated the value of this work, and strongly supported the RSC to continue to deliver this work as they also valued the support for local volunteers and training opportunities that the social enterprise model offered. 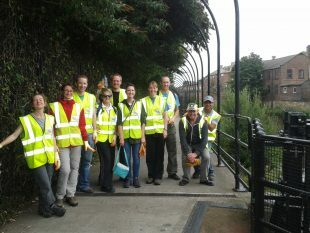 This remains a unique and exemplary success story delivered by sustained partnership working over more than a decade which has been driven at different times by the Environment Agency, Sheffield City Council, the River Stewardship Company, local organisations and businesses. Other cities across Yorkshire and in other areas of the country have started to adopt parts of this model and progress continues to happen in a number of key locations where major flood schemes could benefit from this model to help them to continue to both reduce flood risk whilst enhancing places and spaces around our rivers and waterways.